The crusade to stop King County’s new youth jail — and abolish youth detention overall — got a harsh dose of reality when five teens were charged in a brutal Burien killing. 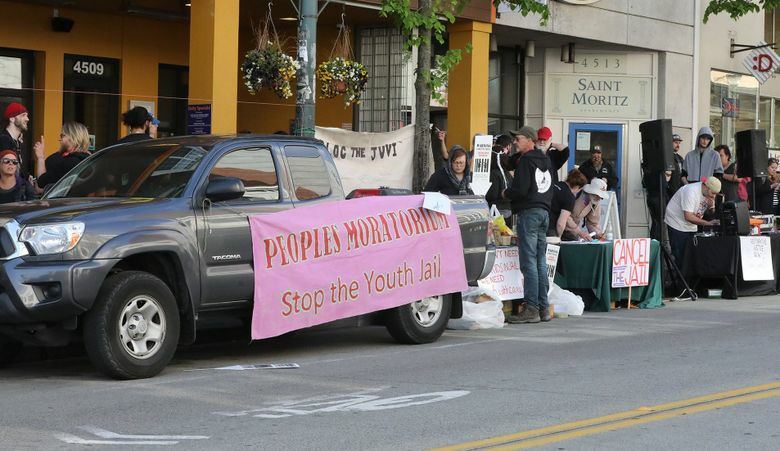 Awkward that there was yet another protest Tuesday against the premise of building a youth jail. “We’re here to tell Dow Constantine and all of King County, stop caging children!” went the cry during a demonstration outside the U District office of the construction company building the county’s 112-bed youth jail. “Zero youth detention now!” read a sign. It was a little awkward because just the day before, on Monday, King County announced it had arrested five such youths — between the ages of 17 and 19 — and charged them with planning the execution-style killing of a 21-year-old man in Burien last year. The claim made by prosecutors is that the youths shot Erasmo Plata 28 times behind a convenience mart, with the onslaught caught on store video. At the time of the killing, four of the five were under the age of 18. “Each of the five defendants presents a grave risk to community safety,” prosecutors wrote in requesting $1 million bail to hold each of them. These five kids should be locked up — if by “locked up” we mean held, for the time being, in detention to separate them from the broader community. What else can we rationally do with people who allegedly shot someone 28 times? The protesters are calling for the construction of the jail to be halted. Their larger argument is that there should be no jails at all. The entire system for punishing kids for committing crimes should be abolished and replaced with alternative means of rehabilitation that don’t involve detention at all. I agree with many of the reforms being proposed for the youth-justice system. Personally I am in favor of the county trying alternatives such as the so-called “peacemaking circles.” That’s where juvenile offenders, instead of going on trial, are held to account for their actions in a months-long process of talking with family members, educators, a judge and sometimes the victims and their families. But that’s for lesser crimes. Not for people who shoot someone 28 times. The case of the five youths is awkward for more reasons than just its timing. Four of them were in and out of the county’s juvenile-court system in the past. And in all four cases, they were granted just the sorts of alternative-sentencing schemes that are designed to give young offenders a second (or sometimes third) chance. One of the boys was arrested when he was 16 on suspicion of dealing baggies of methamphetamine. He was diverted to King County’s juvenile drug court, going to treatment instead of detention. Court documents show he was in that rehabilitative program last week when he was arrested in connection with the killing. Another of the boys got a deferred sentence for an attempted robbery when he was 14. This means he was allowed to go free, without a trial, with the catch being the charge could be reinstated if he got in any further trouble. But that concession had to be revoked when he was arrested at 16 on suspicion of possessing stolen handguns. Now 17, he is facing a conspiracy-to-commit-murder charge for the Burien killing. With that record, surely he shouldn’t be freed, even before his case is heard? Teens who kill isn’t common, but neither is it that rare. Since Jan. 1, 2016, county prosecutors have charged 22 juveniles for their involvement in homicides, almost all committed with guns. Many of these teenagers are locked in the old youth jail right now, awaiting trial. Even as protesters outside argue for … what? Letting them go? That seems like about the right balance. Zero youth detention is a slogan, at its most hopeful a future goal to strive toward. But five young people on million-dollar bail show it’s right now a dangerous fantasy. Corrected: An earlier version of this post incorrectly said a teen suspect in the Burien killing was in a juvenile drug-diversion program at the time of the killing. He was in the program at the time of his arrest.